In an industry inundated with meritless claims, it can be tough to make it as a home inspector. Even if you do nothing wrong, you can end up being blamed, leaving you frustrated or, worse, out of business. InspectorPro Insurance aims to change that culture. InspectorPro Insurance is one of the leading home inspection insurance providers in the nation. With a reputation built on superior claims handling and quality customer service, InspectorPro gives its clients peace of mind. Its risk management education works to decrease how often claims arise. And when claims do occur, its errors and omissions and general liability insurance policies are built to serve your unique business needs. In this episode, I talk to Stephanie Jaynes, InspectorPro’s Content Marketing Manager. We talk frankly about the most common claims in the home inspection industry and how home inspectors can mitigate their risk with tools like pre-claims assistance, solid report and contract writing, and E&O and general liability insurance. Still have questions for InspectorPro? You can reach their team at 866-916-9420 or weprotect@inspectorproinsurance.com. You can also email Stephanie directly atsjaynes@citadelus.com. 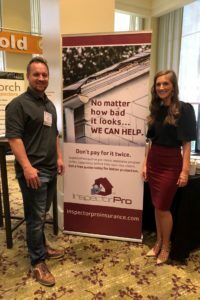 Stephanie Jaynes was interviewed by Preston Sandlin of Home Inspection Carolina and Ask the Charlotte Inspector.